An "e-Health Governance" solution to facilitate national and local-level planningto improve efficiency and healthcare performance in society. A comprehensive health IT solutions for Governments, Health Ministries, Research Institutes or Non-Governmental Organizations (NGOs) to benefit health of the population. H-Connect Digital Health Enables collection of all health and non-health parameters or integrate with any existing system, encompassing all public health domains including maternal and child health and family planning. With the integration of GIS along with health information, a panoramic view of the geographic determinants of health can be captured by the governing agency. Unique Digital Health account for each Citizen linked with UDID like Aadhar card. Emergency card for all citizens with emergency call and emergency access of health record. 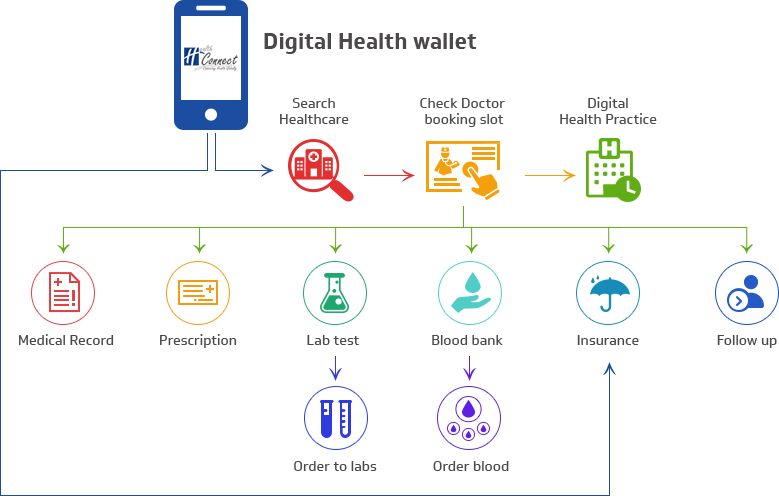 Integrates all health centres or use H-Connect as standalone system to deliver patient reports in Digital Health wallet. Seamless transfer of health data from primary care to health department. Health center connected with pharmacy, lab, blood bank, insurance etc.. Build clinical analytics dashboards and enhance quality care. Schedule reports on email for different stakeholders. Integrate with Government health schemes to give benefits to Citizens. Analytics helps for new or update health policy. Patient and clinical details on mobility useful for mobile van and rural health centres.